Trouble is brewing down on Mrs Tweedy's poultry farm - the chickens are revolting (yes, that old chestnut) and clucky hen Ginger (voiced by Julia Sawalha) is planning her latest coop, um, coup. Getting one or two birds out of the farm is no problem whatsoever. Unfortunately, Ginger plans to get everyone out at the same time, and when one of the would-be escapees happens to be kind-hearted but bird-brained Babs (Jane Horrocks), well - Ginger is fighting a losing battle. Despotic owner Mrs Tweedy (Miranda Richardson) plans to turn the birds into the tender filling of her new range of home-made chicken pies, and is waiting until the hens have fattened up. Ginger knows that time is of the essence but every daring scheme - trying to walk out of the camp hidden under a feeding trough, catapulting over the barbed wire, dressing up a tower of chickens as Mrs Tweedy and walking past the guard dogs - ends in disaster and another night in the coal shed. Ginger needs a miracle. And fast. As she contemplates her next escape attempt with Scottish engineering genius Mac (Lynn Ferguson), Ginger witnesses a glorious sight: a rooster named Rocky (Mel Gibson) flying over the fence and into the farm. And suddenly she sees their salvation: if the cocksure Rocky can teach all of the hens how to fly then they can all fly out of Tweedy's clutches before she gives them the chop. Simple. Or it would be if the brash American was everything he claimed to be. 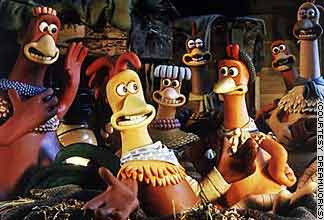 Aardman Animations, the studio behind the wonderful Wallace and Gromit films, delivers a magical first feature film in Chicken Run, essentially The Great Escape played out with a cast of Yorkshire fowl. Karey Kirkpatrick's screenplay, based on an original story by directors Nick Park and Peter Lord, retains the studio's trademark, quirky humour, but also manages to incorporate lots of clever filmic references including Stalag 17, ET and Star Trek. The level of detail in the characters is extraordinary. All of the main players are immediately recognisable and each bird has his or her own distinct personality: from elderly cockerel Fowler (Benjamin Whitrow) who regales the troops with stories of his wartime exploits with the RAF, to loveable but dim Babs, and of course the lovebirds Rocky and Ginger.